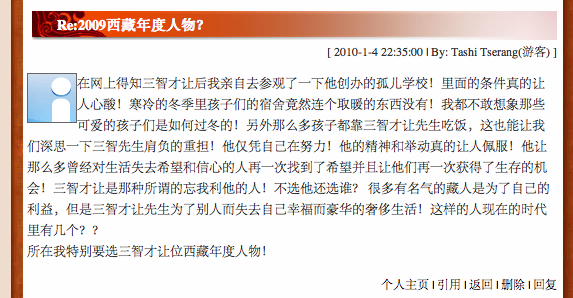 High Peaks Pure Earth has been following an online poll posted on the blog of the popular Chinese language Tibetan website TibetCul.com. 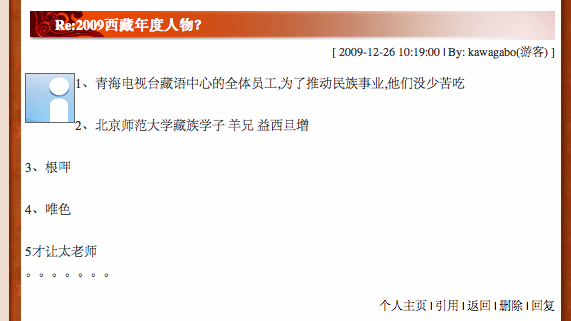 The poll asks readers to nominate the 2009 Tibetan Personality of the Year and was started on December 18 2009. The nominations period will close on January 28 2010. Those nominated by Tibetan netizens give an insight into the influential and respected figures in Tibet today and the wide variety of fields they are involved in. Some names will be familiar to regular readers of High Peaks Pure Earth, such as prominent writer, poet and blogger Woeser and Labrang monk Akhu Jigme (also known as Lama Jigme). The nominations reveal that Tibetans are very much concerned with issues of culture and social welfare. Leading the nominations is film director Pema Tseden who manages the almost impossible task of balancing acclaim from and in China whilst remaining popular amongst Tibetans, as these nominations attest to. Read and listen to Pema Tseden’s first ever interview with a Western media outlet (America’s NPR) here, a link to his latest film “The Search” is included on the page. Another much nominated cultural figure is young Amdo poet Gadai Tsering who writes in Chinese, here is a link to his blog. Despite having an endorsement for his poetry from Woeser on the main page of his blog and overtly political themes in his poetry, Gadai Tsering also enjoys official literary acclaim. 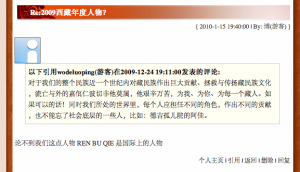 In October 2009 it was announced that he was in the “2009 China Top 10 Minority Poets” and he had previously received the titles of “National Top 10 Minority Poet” and “2006 Northwest Outstanding Poet”, amongst others. Also nominated are the editors of the literary magazine “Shar Dungri” (The Eastern Snow Mountain), a publication that contained many articles and essays about the protests of 2008, many of which were translated from Tibetan into English by International Campaign for Tibet and published in their report “A Great Mountain Burned By Fire”. Many of the grassroots figures are engaged in charitable projects such as schools and orphanages. Whereas there is little information available in English online about Samdup Tsering’s orphanage, a 2006 McKinsey China development report tells us that the Sherig Norbu Jigme Gyaltsen School in Golog, Amdo, was founded in 1994 by Jigme Gyaltsen and “combines a traditional Tibetan education, which includes logic and debating techniques rooted in Buddhism, with a modern Chinese education taught in Mandarin and English.” The school is also mentioned in this 2008 blogpost about a trip to the area the previous year and here is the link to the English page of his school’s website. Keep checking back on High Peaks Pure Earth for more translations of comments and, of course, for the results of the poll, once they are announced! 2009 Tibetan Personality of the Year? 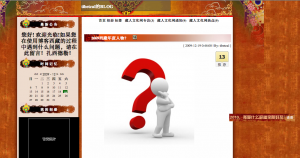 Who is 2009 Tibetan Personality of the Year? Let us discover together, choose together, document together and let their spirit and power warm us, inspire us and guide us. 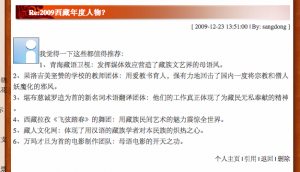 individual powers to expound the outstanding spirit of the Tibetan nationality? 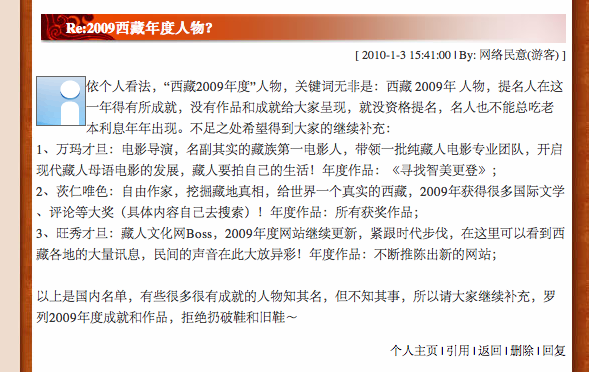 Which Tibetans in 2009 who affect our lives are we proud of? They may already be famous or perhaps are completely unknown; some may be high-spirited and some may be awe-inspiring. In 2009, these people remain in our field of vision. Their life paths mark this era. Because of this, TibetCul has planned a special event for the year’s end – to choose the “2009 Tibetan Personality of the Year”, the selection will be made by the readers of the TibetCul network and netizens based on Tibetan individuals or groups in 2009 who have attracted the public attention of the masses in all Tibetan areas and influenced different fields, finally the “2009 Tibetan Personality of the Year” will be announced. in 2009, their personal behavior, thoughts and words embodied the spirit of the Tibetan nationality and made an outstanding and significant impact on society. The nomination period is from December 18 2009 to January 28 2010, nominations outside this period of time will be considered invalid. If everyone knows then you should say it, it’s the responsibility of Tibetans. Whilst paying close attention and prioritising those who contribute to Tibetan people and Tibetan culture by using Chinese, it is important not to forget those who contribute to our culture and groups using our mother tongue. Otherwise at the end, Tibetan culture, the foundation of Tibetans, will be lost. Monlam, founder of Tibetan language software, Monlam’s version 3 is convenient to use and [brings] confidence [to the user]. We should hold it in esteem. 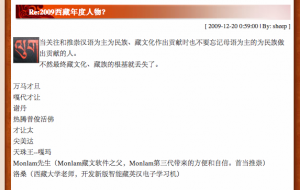 Luozang (Lobsang) (Teacher at Tibet University, developer of new version of Tibetan English Chinese electronic dictionary? 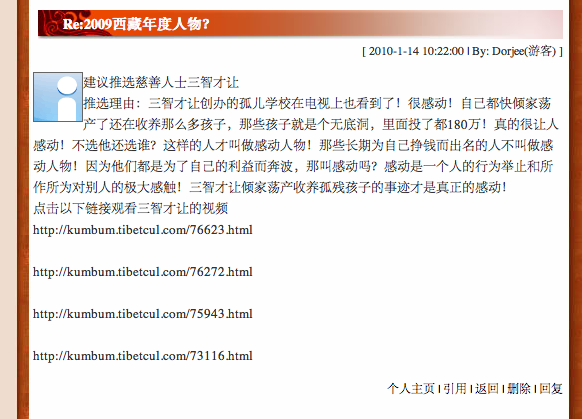 Also there are those who lost their lives in 2009 for Tibet, do you dare to pick them? Do you dare to pick Woeser? 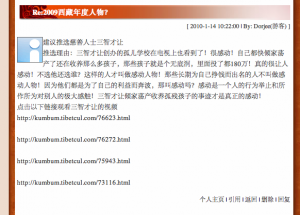 Dear friends, if we are participating in choosing “2009 Tibetan Personality of the Year”, I think we should calm down first and think carefully before we choose. 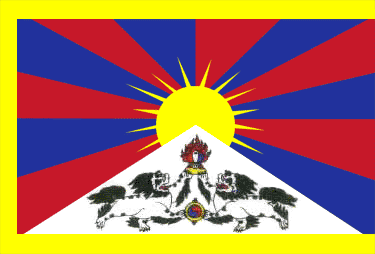 We should vote for our sun, our distant saviour (we would all want to vote), or those Tibetan heroes who have risked their lives on Tibetan land, but we can’t do that. If we all went and voted for them, this website and this forum would quickly come to an end as a result. Therefore I hope that everyone will face the reality and choose those around us who do things for all Tibetans. I choose Snowland’s Jigme Gyaltsen, head of the Welfare School. He is very well known in the Amdo regions and a great educator! His students are from various parts of Tibetan areas including four provinces and one prefecture. He himself is a monk! (1) Qinghai Tibetan TV: using media to create native Tibetan literature and art style. (2) Teachers of Jigme Gyaltsen School in Golog: they teach with love which vigourously fights back the propaganda of demonising religion and monks. (3) The new terminology translation group led by Khenpo Tsultrim Lodoe: their work truly reflects the spirit of selfless dedication to the Tibetan people. (4) The Tibetan dance performance “Welcoming Spring” by the troupe from Lhatse, Tibet: Stunning the whole world with the charm of Tibetan folk arts. 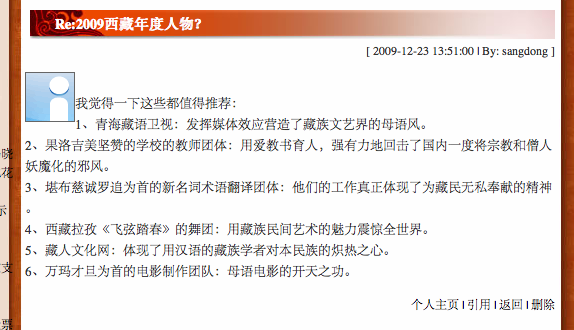 (5) TibetCul: platform for Tibetan scholars to express their love to the their communities in Chinese language. (6) The film production team headed by Pema Tseden: creators of film in the mother tongue. Highly recommend Gannan’s Gadai Tsering! He received the title of one of the top ten cutting-edge poets in the country, as well as the fifth Gansu Minority Literature Prize. Nominating poet Gadai Tsering! True to life poetry! Regarding the most competitive candidate for nomination, this should go to Gyalwa Rinpoche (Tibetan for Dalai Lama) who made significant contributions to preserve and promote Tibetan culture in the past century in the entire nation and who was exiled. He suffered for you, for me and for every Tibetan. In this world, each individual plays a different role and makes contributions in various areas. Yet, we cannot forget those who work for the marginalised people, for example, the lady who runs the Dekyi Orphanage. Nominating the editors of the journal “Shar Dungri”, because of “Shar Dungri” our Tibetan literature started on a common road, democracy, freedom, rights, harmony, equality. These subjects are the struggle of our time, the goal of Tibetan youth. Recommend Beijing Normal University’s “Sheep”, every young person can learn from his determination, his energy is very similar to my Amdo classmates. Passion, energy, ambition, dreams. 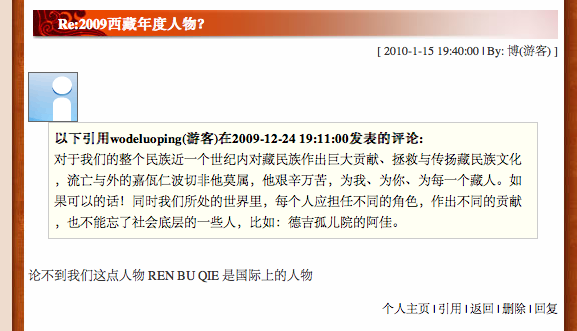 I think my classmate who is from Amdo, studying at Qinghai Police University should be nominated. We should all learn from his spirit, hope the community will nominate him. Nominate: Pema Tseden, independent Tibetan filmmaker, he has a sense of responsibility for his nationality. Regardless of his own life. Regardless of his own future. For the struggle of a nationality. 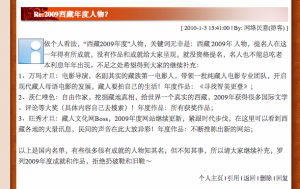 In my personal opinion, “2009 Tibetan Personality of the Year” is made up of the key words: “Tibet” “2009” and “Personality”. Only those who present some achievements are eligible to be nominated. Celebrities can not always rest on their laurels and be nominated every year. People are welcome to add their thoughts if they differ from mine. Pema Tseden: film director, he really lives up to the title of the first Tibetan filmmaker. After I read about Samdup Tsering on the internet, I personally went to visit the school he founded for orphans! The conditions inside make you feel very sad! The children’s dorms in the cold winter didn’t contain even a single warm thing! I can not imagine how those cute kids spend the winter! Also, so many children depend on Mr. Samdup Tsering to eat, which makes us think deeply about the burden placed on Mr. Samdup! He can only rely on his own efforts! His spirit and actions should be truly admired! He made so many who had already lost hope and confidence in life once again find hope and allowed them a chance to survive! Samdup Tsering is a selfless and altruistic kind of person! If he is not nominated then who will be? Many Tibetans are famous for their own interests, but for the sake of others, Mr. Samdup Tsering gave up the luxury of his own happiness and luxurious way of life! How many of this kind of person are there in this day and age? That’s why I really want to nominate Samdup Tsering to be Tibetan Personality of the Year! Agree; nominate Pema Tseden, he has the qualities to be this personality. They are both quintessential of a generation of Tibetan youth, both have made extraordinary contributions in their fields! Recommending the nomination of the charitable Samdup Tsering. Reason for nomination: Samdup Tsering’s orphanage that he founded can also be seen on television! Very moving! Although he almost became bankrupt, he adopted so many children. The investment was huge, it could have been as high as RMB 1.8 million! It is really impressive as well as moving! Who to nominate, if not him? He deserves the title of moving figure! Those who are famous for their fortune do not deserve the title since all they have done is for their own interests. Only those whose behavior and achievement contribute for the good of others can really touch people’s hearts. The fact that Samdup Tsering could risk the loss of his own fortune to adopt orphans is really moving! She is the quintessence of we Tibetans! On this point, Rinpoche is no less than an international figure. I think there are many Tibetans abroad, prominent figures, vote for them, they are pretty great, better not to vote for political figures, such as Ngapo, who many Tibetans have opinion on. Thank you! My vote goes to all the Tibetans who resists. Especially to those who rose up recently. Gadai is Gade (Dga' bde). Who is this young "Sheep" 2 mentioned in 2 comments ? A-MA-ZING. What a delight to read the comments that people left regarding the personality of the year.